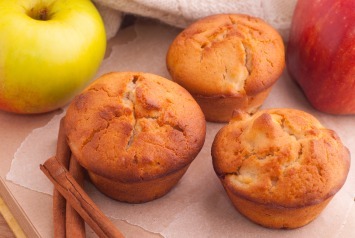 These yummy spicy apple muffins will be a hit with young and older alike! Muffins are such a warm and welcome treat. These are rich with cinnamon, cloves and nutmeg, and moist with raisins and apple chunks. Combine the flour, sugar, baking soda, salt, cinnamon, cloves and nutmeg in a large bowl and mix well. Stir in the apples, raisins, oil and eggs. Stir just until the ingredients are incorporated together. Do not beat the batter or the muffins will not be as tender as they should be when they are baked. Fill 12 lightly oiled or paper lined muffin cups. Bake for 35-40 minutes in an oven preheated to 325°F. I am not a clove lover, so I would cut the cloves to 1/4 teaspoon and add a touch more cinnamon. Add nuts for extra crunch and nutrition. I love walnuts in this recipe but you can add chopped almonds or pecans too. Look here to see why walnuts and almonds are so good for us. You can adjust the amount of sugar down a bit if you like or replace part or all of the sugar with a product like stevia for a low sugar or sugar free apple muffin recipe. You can also up the nutritional content by replacing at least 1/2 of the white flour with whole wheat flour. If you use whole wheat flour it is always best to sift it first. Sifting lightens up the texture of the flour and also removes the larger bits of bran that are still in the flour. This makes your muffins as light as if you had just used the white flour, but with more nutritional value. Any way you make them this easy muffin recipe is a delicious and healthy treat. As with all muffins, don’t beat the batter or over mix it. Muffins come out lighter and fluffier if you just mix the ingredients until they are well combined. Beating the batter will make it tougher. Look here for another recipe for apple muffins – low fat muffins with walnuts.